Amazon offering MakeMyTrip Holiday Gift Card Rs.5000 at Rs.3750 only. This Gift card is not valid on Flights, Hotels, Bus and Rail bookings. Gift cards are not valid on bookings made through MMT Mobile App. 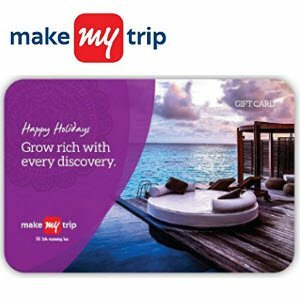 This Gift card cannot be clubbed with any other offer currently live on Makemytrip.com- cash backs, discounts etc. on a particular credit/debit card. This Gift card is valid for partial redemption. Balance would remain in the Gift Card till the validity period and can be reused for multiple transactions. Multiple Gift Cards (upto 3) can be combined and used on 1 transaction.